Prepare a baking rack for your cones by turning an aluminum foil baking pan upside down and cutting out 12 evenly-spaced quarter-sized holes in the top of the pan. Secure the ice cream cones in the holes so that they stand up straight with the open ends of the cone facing up, adjusting the size of the holes if need be. Fill each ice cream cone half full with cake batter. Then carefully transfer to the oven and bake for about 10-12 minutes, until cake batter is cooked through and the tops spring back lightly if touched. Remove pan from oven, and immediately use a pair of scissors to snip off the bottom inch or so of each cone. You want the opening large enough to place your teepee toppers in there. Then let the teepee cakes cool completely. Once the teepee cakes are ready, heat your chocolate chips in the microwave or double boiler. If they are extra thick, stir in a teaspoon or two of shortening until a thinner consistency is reached. Dip the wide end of the ice cream cone in the melted chocolate so that the chocolate comes up the side of the cone , and then carefully dunk it again in a bowl of sprinkles. Repeat on the small end of the ice cream cone, and then stick a few chow mein noodles in the top to complete your teepee. Place the teepees on a sheet of wax or parchment paper to finish drying. Then serve once cooled. It’s time to teepee…your Thanksgiving cupcakes! For me, Thanksgiving season was always the best time for craft-making when we were kids! From the trace-your-hand turkey drawings, to construction paper teepees, to thankful trees and more. Thanksgiving was definitely the time to get your craft on! But I always thought it was even more fun to get crafty with food. 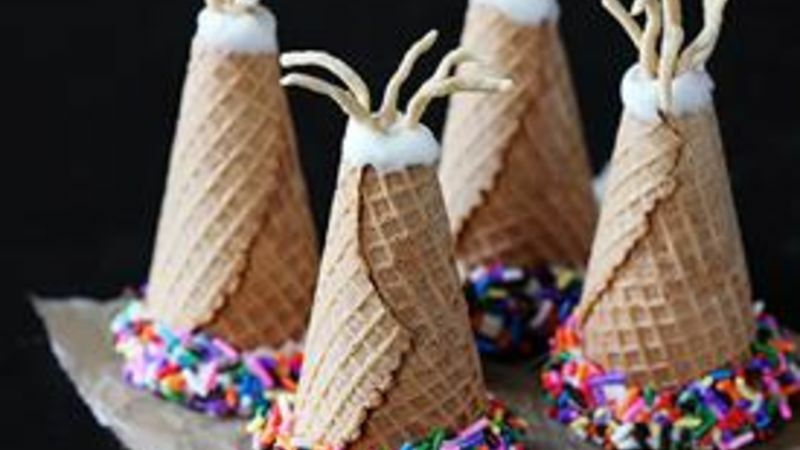 So for your Thanksgiving treats this year, check out these adorable Ice Cream Cone Teepees!!! Made simply with cupcakes baked into ice cream cones, everyone will love making and enjoying these festive little treats. The trickiest part is at the beginning. You need to find a way to stand up the ice cream cones so that they can bake in the oven without toppling over. I rigged an aluminum foil baking pan – just turned it upside down, and then cut 12 quarter-sized holes throughout. Once the cakes are baked, immediately remove the cones and use a pair of scissors to snip off the bottom inch or so of the cones while they are still warm (and are less prone to cracking). Let the cones completely cool. And then dip the bottom of the cone in melted white chocolate, and then coat with sprinkles. Then dip the other end of the cone in white chocolate, and place some chow mein noodles in the top. Let cool on a sheet of wax or parchment paper. Then serve them up! Aren’t they adorable? ?